Today, we spend a lot of time trying to understand the roots of poverty. This was not so 200 years ago. When Adam Smith wrote "The Wealth of Nations" his task was to explain why a very few nations at the time seemed to be getting wealthier. 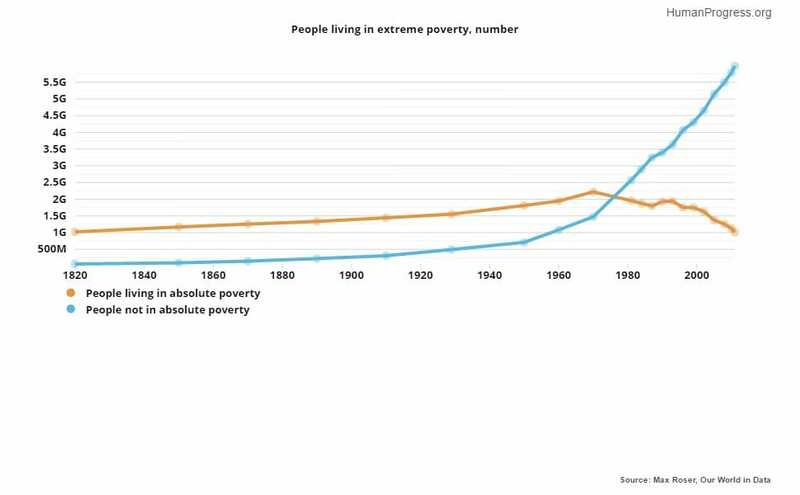 Poverty at the time and through most of history was accepted as the norm. Only the advent of free inquiry and (relatively) free markets has changed that norm. As Brad Delong says (yeah, yeah, I know, but he's an excellent economic historian) the one great economic fact we've got to explain is what the hell happened post 1750 in England and then spread? That's the great discontinuity, whether we use Delong's numbers, those of Angus Madison, Marx, Engels, more recently Max Roser. Any economic theory which does not explain this isn't worth the name of a theory. Sure, you, I, we generally here, we think we know what happened. But any theory that cannot explain that fails, hard. But but but things are always getting worse, aren't they? Of course, the only way they can realistically hope to eliminate income inequality is to make everyone poor. The question is whether in the long view it will appear to be just a passing phase. Two inventions, which worked for similar reasons: the steam engine, and the joint stock corporation. The steam engine allowed a single worker to control more energy than previously possible, and the joint stock corporation allowed a single individual to control more capital than previously possible. The growth in both the productivity of labor and productivity of capital entered a positive feedback loop. We may be in a similar age where the productivity of knowledge enters into the same cycle. Interesting graph... A question I'd ask, however: How is the dividing line of "absolute poverty" defined? A related question is whether the numbers are somewhat skewed by subsidies provided for the empoverished? That is, does it count people as empoverished, when their actual lifestyle and standard of living have been raised above a level that does not demonstrate an empoverished existence? Poverty is the default condition of mankind, says Thomas Sowell. No study or understanding of poverty is needed. One can just sit around and watch it happen.